Bobby Jones likened the putting stroke to driving a tack into the back of the ball. I've always thought that was a good image. However, it was probably more useful in Jones's era than it is today. Back then, the greens were a lot thicker and slower, and the ideal stroke was a forceful, aggressive pop through the ball. But on the close-cut superfast greens we play today, smoothness and control are the keys. Driving a tack may suggest too vigorous a hit. Still, the notion of bringing the putter into the back of the ball is, I think, an important one. That's why when I putt I don't just look at the whole ball, I look at the back of the ball. By focusing on the back, you help ensure that you'll strike the ball from straight behind it, which in turn will encourage you to make the proper low back-and-through stroke. 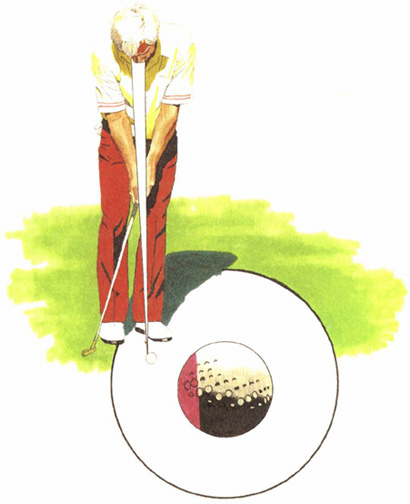 It is only this type of stroke that imparts a true roll to the ball.